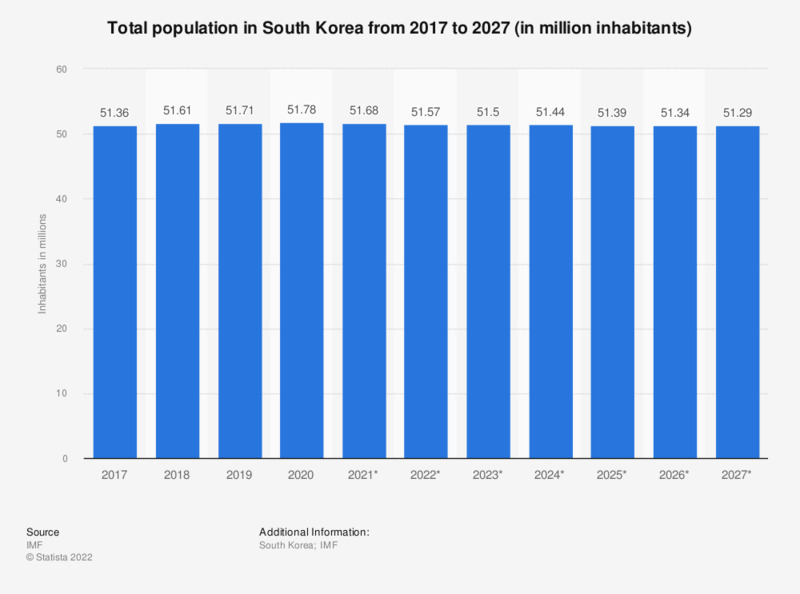 The statistic shows the total population of South Korea from 2012 to 2017, with projections up until 2022. In 2017, the total population of South Korea was about 51.45 million people. South Korea, also called Republic of Korea, has one of the highest population densities worldwide, i.e. a very high number of inhabitants per square kilometer. However, this does not equal bad standard of living; on the Human Development Index, which ranks countries by their level of living standards using key factors, such as unemployment rate, literacy rate, fertility and mortality rates, etc., South Korea is among the highest-ranked countries. When looking at the aforementioned key factors, South Korea indeed seems to offer a fairly stable environment for its inhabitants, economically and demographically: The country’s unemployment rate has been relatively steady for the past decade, its gross domestic product (GDP) is constantly increasing, and it is among the countries with the highest trade surplus worldwide. As for standard of living, life expectancy at birth in South Korea is among the highest worldwide – South Korea is even mentioned in a recent ranking of the best birthplaces for children. Despite the high population density, South Korea is now one of the countries with the lowest fertility rates, i.e. the number of babies born by women of childbearing age. This apparent discrepancy could be explained by a high number of immigrants coupled with the aforementioned high life expectancy. Everything On "Inter-Korean relations and issues" in One Document: Edited and Divided into Handy Chapters. Including Detailed References.